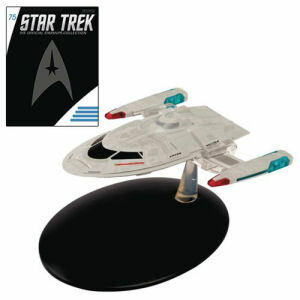 We have Just Sold out of Star Trek Starships Enterprise E Captains Yacht Die-Cast Vehicle with Collector Magazine #75. Not to Worry! Fill in the Notify me When Available and you will be the first in line for our restock of Star Trek Starships Enterprise E Captains Yacht Die-Cast Vehicle with Collector Magazine #75 !! From the Star Trek Starships collection by Eaglemoss Publications. Star Trek Starships Enterprise E Captains Yacht Die-Cast Vehicle with Collector Magazine #75. Add this incredibly detailed diecast starship to your collection. The Star Trek starships collection includes all of the most significant ships from the 5 television series. Starship comes with a collector magazine! Ages 14 and up.